We have just a few swimmingholes so far for Puerto Rico so these are presented without a map at this time. Please send us E-MAIL if you have a swimming hole to add or if you have more information about one that is already listed. Thank you. 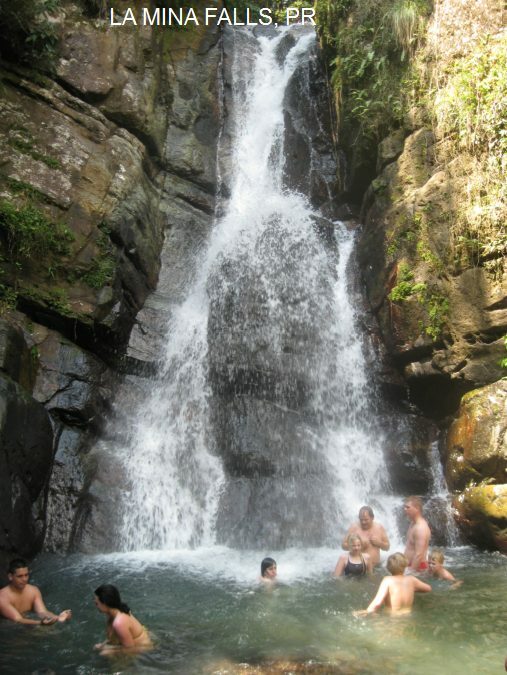 There are several swimming holes and waterfalls in the Carridean National Forest in Puerto Rico, 45 minutes drive east of San Juan in the El Junque rain forest. a good website about this area. Note: There is a gate along the road in that closes at 6 PM. You should arrange to be out before then unless you are spending the night and have secured the necessary (free) permit. See DIRECTIONS below for details. Some camping in N.F. - Click for camping info. From San Juan, take RT 3 east then RT 191 south into the Carribean N. F. and look for signs to La Mina trail (45 minutes drive from San Juan). There are 2 trailheads from this road. The 1st is less steep but slightly longer. The 2nd is steeper. It is paved with steps and handrails. LA MINA TRAIL [LAMT]: There are several swimming places along the La Mina trail in the El Junque area of the Carribean N. F. - 45 minutes drive east of San Juan. 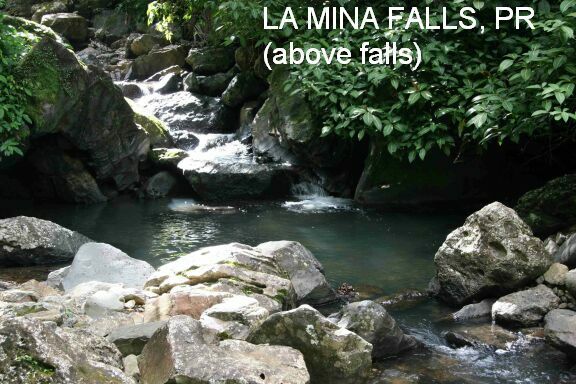 Hike the La Mina trail and find the swimming holes. Click for hiking map. LA MINA FALLS [LAMI]: La Mina Falls is about a .5 hour hike on the La Mina trail. First you come to a small swimming hole above the falls, then to La Mina Falls itself - a beautiful 35 foot cataract with a swimming hole at the bottom. 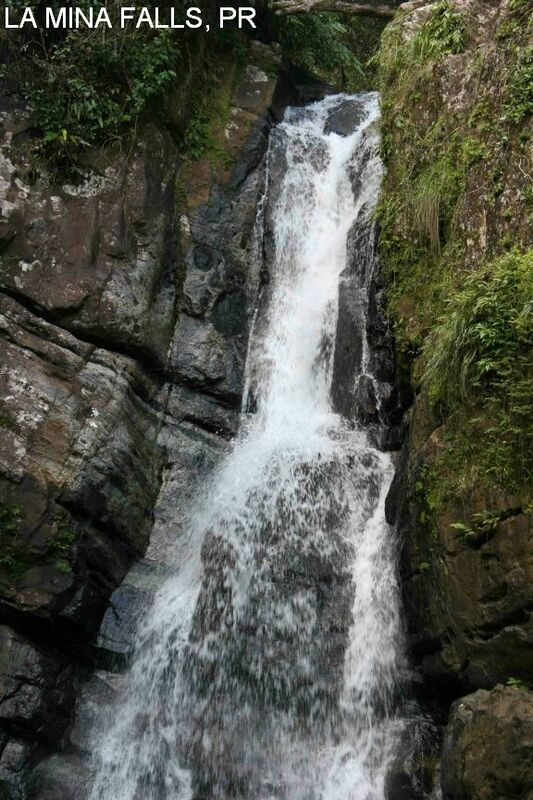 PHOTO , PHOTO , PHOTO , LINK TO PHOTO OF LA MINA FALLS LINK TO DOWNLOAD AN MPG MOVIE which is of these falls. There are several swimming holes in the Bosque Estatal De Carite (Guavite) area, about 1 hour drive south of San Juan. In this area, there are about 25 trails and 3 rivers, so there may be many more swimming holes. See DIRECTIONS below for details. There are 2 campgounds in the area - one at Charco Azul and one at Guavate. Directions are from San Juan. BLUE HOLE GUAVATE [BLUG]: Easy hike to a blue-water swimming hole. To get here from San Juan, take RT 52 south then RT 184 east. On RT 184, after La Ruta Panomerica (but before the lechonerias), look for signs to Carite. The trail that the swiming holes is on begins at Charco Azul. NO details on this trail - I think it is a short hike.